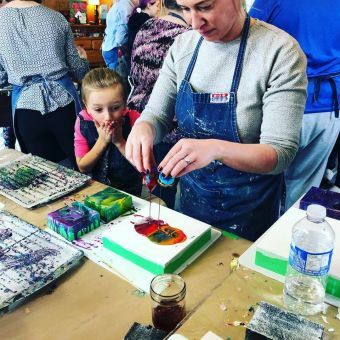 This after school four week workshop series for children (9+ years old) will cover many aspects of Liquid Glass Pouring Medium. The children will learn colour theory, multiple techniques including dirty pour, flooding and playing with tools, plus building a texture to pour over. We will play with locally made Liquid Glass, which is an absolutely magical acrylic Pouring Medium made right here in Kingston by TriArt. The children will complete 7 pieces during the 4 week sessions. To register please purchase your ticket through EventBrite. Click ticket link above. This workshop will be held at our studio 214H at the Tett Centre at 370 King St. west. Level 2. As usual snacks and refreshments will be served.